Do they still have an important role? Before the 1950s, most black Americans had little choice but to attend colleges and universities founded for blacks. The outlawing of segregation — 50 years ago next May — gave black students more education options, and many took them. But the nation's 103 historically black colleges and universities (HBCUs) still enroll about 14 percent of African American students. 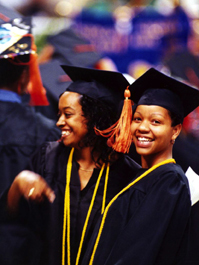 Supporters say black colleges offer important educational and social benefits over predominantly white institutions. Some critics, however, say many HBCUs are academically inferior institutions and do not prepare students for living in a diverse society. Whatever their advantages or disadvantages, many black colleges are in trouble today because of shaky finances and sagging enrollments.